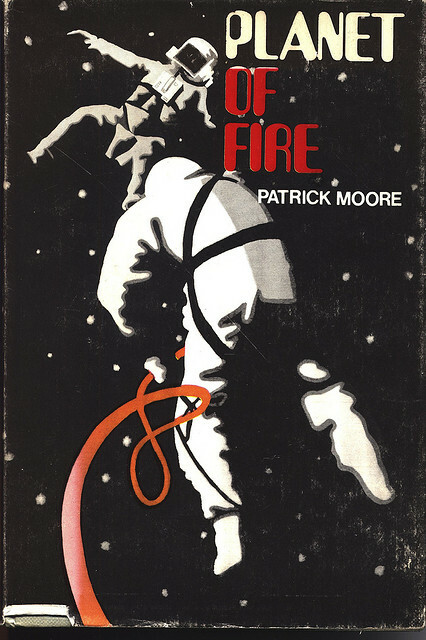 This review has been made public in honour of both the general vintage science fiction movement across the review blogosphere that takes place in January, and also as tribute to the inspirational author of this work, Patrick Moore, who sadly passed away last year. Contains spoilers in the second paragraph. This 1969 children’s book by the astronomer, scientist, author, television presenter, xylophone player, and generally boss-like Sir Patrick Moore is a childrens book, clearly written in order to interest children in science and astronomy. It reminds me nothing so much as a cross between Heinlein’s ‘Space Cadet’ and Clarke’s ‘Prelude to Space’. An orphan rescues two men from a helicopter crash, and they turn out to be nobel prize winners who are planning a trip to Venus in their untested nuclear powered space rocket in order to rescue a crew of Russians who have become stranded in orbit there after a failure of their own rocket. They enlist they excitingly named Barry into their crew of four. The radio operator takes a disike to Barry because he was the hero of the helicopter crash and not him. There are a few problems on the way to Venus, and they are forced to land on the planet and make a trip on foot in order to rescue the Russians. At the end, the radio operator redeems himself by saving the life of a Russian and Barry himself by wading into a pool of lava. They end up the best of friends and the orphan Barry gets a job at an international space centre. I’ve made this book seem a bit generic, and frankly, it is. However, there are a couple of saving graces. For one, the science is kept manageable. Unlike Heinlein’s books where the science interrupts the story for weighty didactic exposition, Moore keeps it to a manageable level without either patronising or misrepresenting it. Also, the language here is fabulous. Very proper post-war intelligentsia bletchley park speak. People get in ‘blue funks’ when upset, everbody ends their sentences with ‘dear boy’ or ‘old chap’, and everyone is dashed sorry to get in such a scrape, but will happily scrap their way out of it, see if they don’t. One of the more interesting points, to me, was the character of Lancelot Britton. A nobel prize winning scientist and the fair minded, likeable, and highly knowledgable leader of the expedition. Who wears a monocle. Now, I’m not saying that the wonderfully named Lancelot Britton is Moore playing out a hero fantasy, but… Actually, that’s exactly what I am saying. The intrepid Britton is clearly the man Moore see’s himself as being. Finally, and this is an important thing to note, is the relationship between politics and science in this book. The mission has been forbidden by the rotten politicians and operates outside their jurisdiction. At one point, Britton mentions that his program is happy to take the governments money, but unwilling to give them any but the meagerest information about what they are doing. Moore is clearly making a point about the importance of allowing scientific research to take place for its own sake, rather than following a political agenda. This follows through in the relations between the characters. The astronauts that Barry and co. fly off to rescue are Russians, and personal friends of Brittons (see what he did there?). Not only that, but a crucial member of the atomic rockets development team is Japanese. Written during the height of the cold war, this book acknowledges a common humanity that overrides national boundaries and emphasises co-operation between progressive people of rationality regardless of political difference. This is a high point of the book and, in my opinion, despite its egregiously liberal borrowing from earlier science fiction authors plots, stands this book out as one of the better examples of its kind. ~ by Snake Oil on January 31, 2013.
o.k. so i missed the first sentence…. move along nothing to see here.